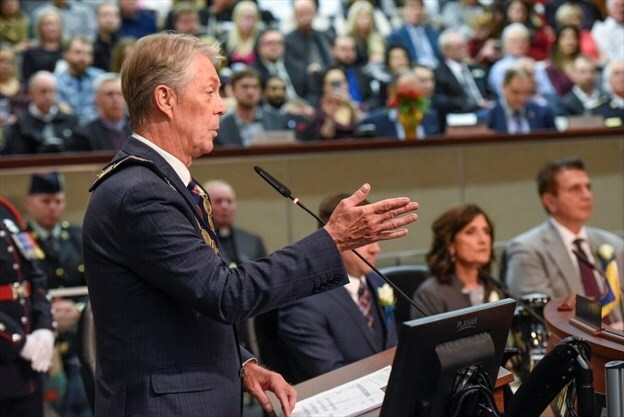 Hamilton is faring well from the provincial budget as far as Mayor Fred Eisenberger is concerned. "The budget isn't the hack-and-slash people were expecting," he said after the budget was presented at Queen's Park on Thursday. Eisenberger called the budget good news in that it confirmed the province's investment in the Hamilton LRT plan. The mayor also lauded almost $4 billion allotted over the next 10 years for mental health, addictions and housing supports for municipalities that he said were in the budget. "Those are positive indicators," he said, adding the province has signed on to its share of the federal affordable housing program, "which bodes well for Hamilton. ... We have our $50-million housing plan, so we'll tap into that $4 billion." It won't likely be enough, since the city has 6,000 households waiting for affordable housing, but "I would say it's a step in the right direction. We have to begin somewhere." Eisenberger was also pleased to see $16 million allotted for cities outside of Toronto and Ottawa to fight gun and gang violence, saying Hamilton police have already applied for $1 million of that. As for the budget abandoning the previous government's commitment to double provincial gas tax revenues coming to Hamilton to about $10 million more this year, Eisenberger wasn't overly disappointed, saying the city didn't have that money in the first place. "On the surface," he said, the Ford government has " done a nice job of balancing cost efficiencies and key investments with public transit, mental health and addictions." His only caution is that it remains to be seen what the budget impact will be on social services. City labour, health and anti-poverty groups, meanwhile, say the budget shows again that the Ford government that touts itself as a government "for the people" is anything but. The budget didn't do anything to improve the lot of low- and moderate-income earners and families, said Hamilton ACORN downtown chair Mike Wood, and in fact continues to making life worse for them. Wood deplored sticking to the $14 minimum wage that would have gone up to $15 an hour, said the budget didn't go far enough on affordable child care, and that the Ford government didn't live up to its election promise to keep the planned three per cent increase on welfare support payments. "We see them working for themselves, and not for the people as they claimed," he said. ACORN and local labour groups are joining rallies across Ontario on Friday, with the local rally being held before 9 a.m. at the Scottish Rite while Ontario Treasury Board president and MPP Peter Bethlenfalvy is speaking. The Hamilton Health Coalition said the budget's seniors dental plan leaves 95 per cent of Ontario seniors out, and that with hospital funding increases being lower than inflation, it means real dollar cuts to hospitals. And the coalition says health-care funding overall is less than inflation, and so it's not enough to maintain existing service levels. Education groups across the province and in Hamilton have already blasted the Ford government for deep cuts to school boards and post-secondary institutions, sounded the alarm on the budget's proposal to overhaul university funding, and warned of an impending crisis in all education. Hamilton Chamber of Commerce chief executive officer Keanin Loomis is pleased with the budget, including its $1-billion commitment for the Hamilton LRT. The chamber also supported the budget measures on climate change, child-care relief, and on allowing tailgating at sporting events, drinking in public parks, and bars to serve alcohol as early as 9 a.m. daily. Making alcohol more accessible is something ACORN's Wood personally doesn't agree with. "There's more important things to take care of than having alcohol more readily available," he said.